Recently one of our new Part V students, Amosa Lene, had the opportunity of undertaking a summer internship in Mumbai with an NGO called Doctors for You, which provides various health-related services to underprivileged communities. Amosa discovered there are some significant differences between optometry in New Zealand and India. For example in India the authority to dilate a patient lies with the doctor, not an optometrist, and basic screening services such as a red reflex test (carried out on virtually every new-born by a neonatologist, paediatrician, or paediatric nurse in NZ) is not standard practice in India. Amosa assisted with a proposal to develop a programme to train members of the local community to conduct vision screening. He described the experience as intense and amazing, and has returned to New Zealand with a new awareness of aspects of health care we often take for granted. 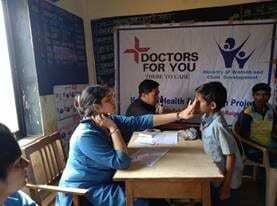 Image: Doctors For You outreach camp in rural India.